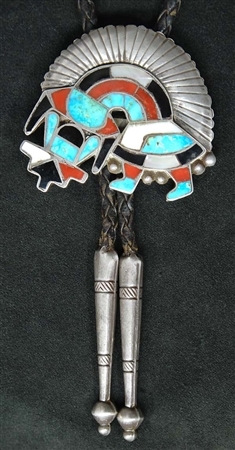 This beautiful knifewing figure was created by well-known Zuni artist Alonzo Hustito. Set with materials of Blue Gem turquoise, jet, Mother of Pearl and coral. 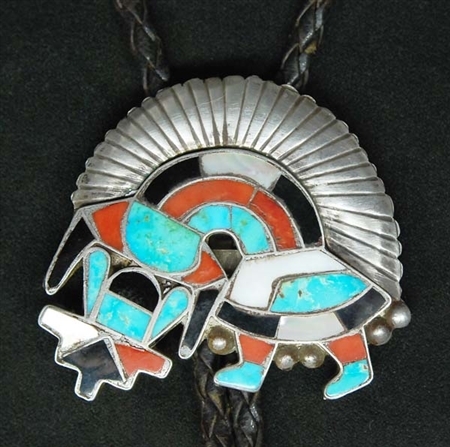 This lovely bolo offers the best of Hustito's precise stone and silver work, with his distinct channel inlay designs of Zuni figures. 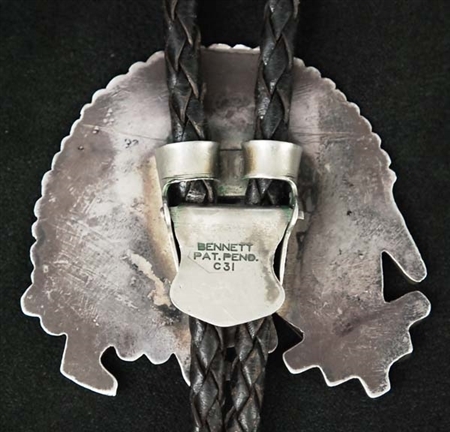 A soft patina graces the entire piece, with the back having a heavy patina. It measures 2" long by 2" wide. The beautiful tips are 1 7/8" long. The black leather strap is 20" total length including tips. Not hallmarked which was common during this era.